I went for a trip to the grocery store to get some snacks and other items I needed. On my way home I was listening to a program on talk radio, Ohio river hour. I turned left down Tealtown off Old 74 and came to a stop about 100 yards. It seemed a car ahead was trying to turn left and we were waiting, then WHAM!! this car hits my car doing 35-40 mph. I flew back as the seat broke and then forward as I hit the car in front of me. My leg was jammed badly into the console and dash. I blacked out briefly and then was in a lot of pain from leg and neck. Leg hurt the more so do to the scrape. Went to the hospital in a ambulance where I got x-rays and my leg was bandaged up. X-rays came back and I was released after I bit of time with the Union Township police officer. 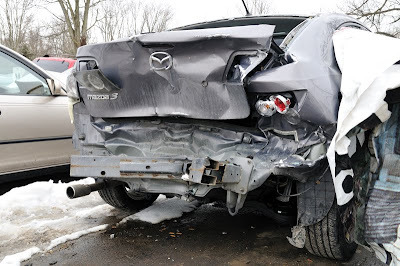 He asked me what I thought happened, I told him the above and he said yup she did not even brake. I was off a couple days at work but felt I was needed so I went in for a half day to catch up and see how It felt. I was sore and tired after 5 hours. So went to the Doctors and then home for a rest. It has been one week from the wreck and it still hurts. I hope I feel better soon. 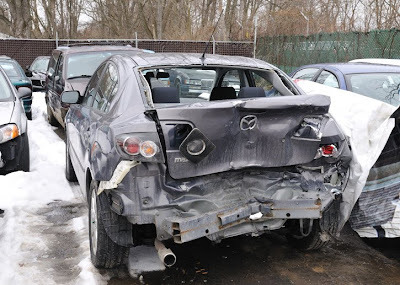 It is always nice to get a new car, this one again was not planned. Just life's moments. 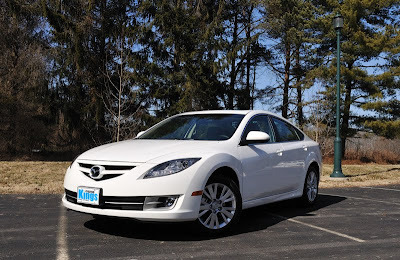 I chose a Mazda 6 from Kings Mazda. Carl works there and I know I will get good service with him. I do not like how March roared in. I am getting to old for this *hit.